Anyway, today a new member has arrived! 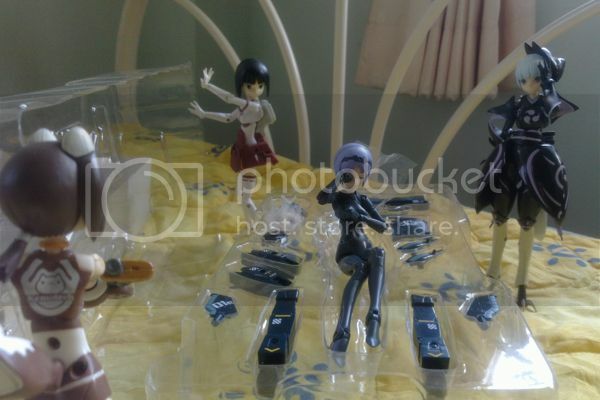 Hayate: Shall we let her out to have some air? Harusame: Let us make haste. Harusame: Not much of an early riser, I take it? "Werkstra": MMS Type Angel Commando "Werkstra", Special Ops Division, reporting for duty, sir! Me: We'll need to give you a proper name, I guess. Hayate: You're a special limited type, right? Any special gears? "Werkstra": I'm not provided with special gear. At least not that I know of. Harusame: Since you are much like Hilde's little sister, perhaps Anne may be a good choice of name. Me: Then Anne it is. Are you fine with that? Anne: Registration acknowledged. 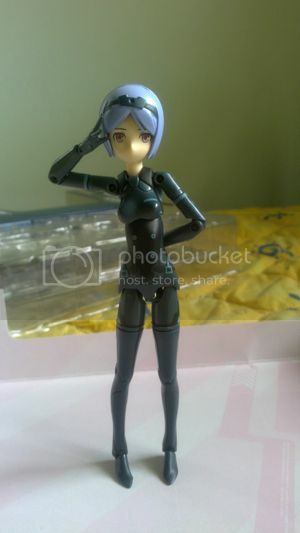 MMS Type Angel Commando, Anne, is ready for duty, sir! 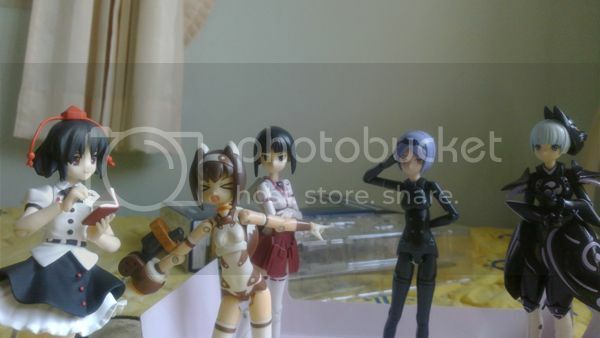 Anne/Hayate/Harusame: ...Who the heck are you? Oh, yeah. Aya also came in the mail from Japan that same day. 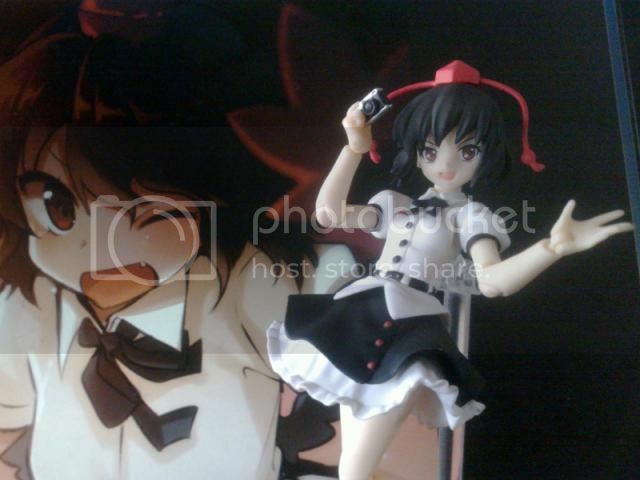 Now I have a proper Touhou Project Figma to play around with (lol). That's it for today. I'll see you next time! Last edited by Adventwings on Sat May 30, 2015 5:04 am, edited 1 time in total. "So any comments on the matter?" hahahaha totally random Aya-bomb! Love it! Pop up Aya is fantastic. Thats how I imagine her, just popping out of nowhere to get the scoop! Wonderful new arrivals! Cant wait to see more! Everyone's trying hard to keep a straight face with little Ritsu hanging around. oOnyaOo wrote: Pop up Aya is fantastic. Thats how I imagine her, just popping out of nowhere to get the scoop! Thanks! Aya's the ever intrepid reporter as always. Hayate: So, did you know? Tomatoes were once declared as the Devil's Fruit by the Church of Rome. 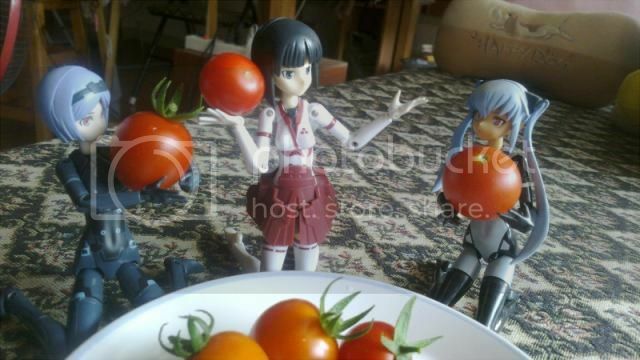 Hayate, Noelle and Anne having a discussion about the cherry tomatoes. These cherry tomatoes were freshly plucked from my yard just a few minutes earlier. They taste great when they're fresh. So, that's probably all for this year's updates. Merry Christmas and Happy New Year to everyone here at Busou Shinki World~! Ah wow! Wonderful fresh tomatoes! Hope you have a wonderful christmas and a fantastic new year! oOnyaOo wrote: Ah wow! Wonderful fresh tomatoes! Thanks, Ava! It's been a really hectic year for me. Thankfully, it's also been somewhat uneventful, which is good news in the kind of age we live in. Anyway, this update is (surprisingly) not really about Busou Shinki, but a series from from the same designer could be said to be the Big Daddy of Mecha Musume. Faces come pre-painted with the signature Fumikane stare. Three faces in total - one looking straight forward, one to the right and one to the left. 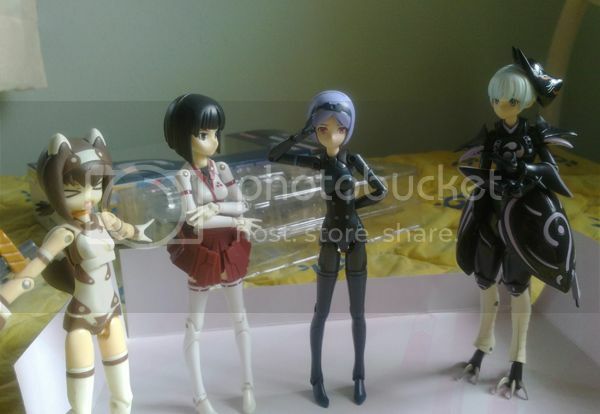 Her head is about the same size as Hayate's, who is a 1st generation MMS. 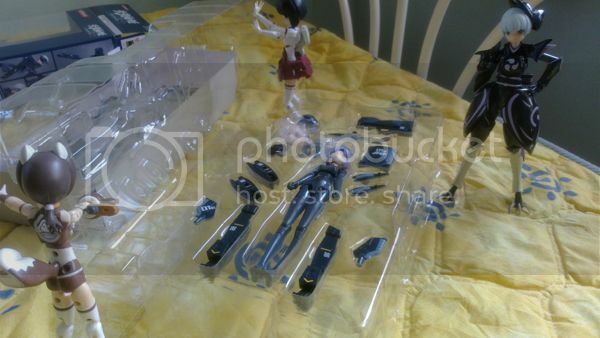 Even though none of the parts come pre-painted aside from her face, they do have water decals included in the box. That means we don't have to paint on her shimapan as anticipated (lol). They even have bear-prints and tiger-prints to slap on her undies, too. Included in the box is also one Free Style Bazooka (the big green gun seen on the side of the box), a small shoulder-mounted cannon and a combat knife, unpainted. You'll need to do some hand-coloring to match her colors to the official artwork, but that's a given with modern plastic models. I haven't had the chance to take her out and build her yet, so we'll see how she looks once I get started. For now, Adventwings signing off. See you next time when I tackle the hurdles of building her properly (lol). Man, I've wanted to get into Frame Arms even BEFORE this...so, is it true the FA Girls are actually compatible with the previous FA armors? 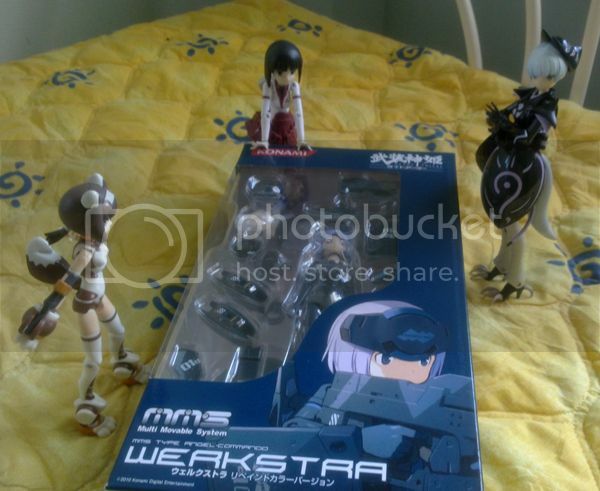 Heckfire wrote: so, is it true the FA Girls are actually compatible with the previous FA armors? Limited at best. FA Girls don't actually have a base body like a Frame Architect, but they do have 3mm ports. You can attach weapons and accessories, but actual armor probably won't attach easily.